The team is excited to finally hit the ice today! Our practice session starts at 9:30 this morning. Our first game is at 6 p.m. vs Newfoundland. We traveled to Sherwood Park on Sunday. 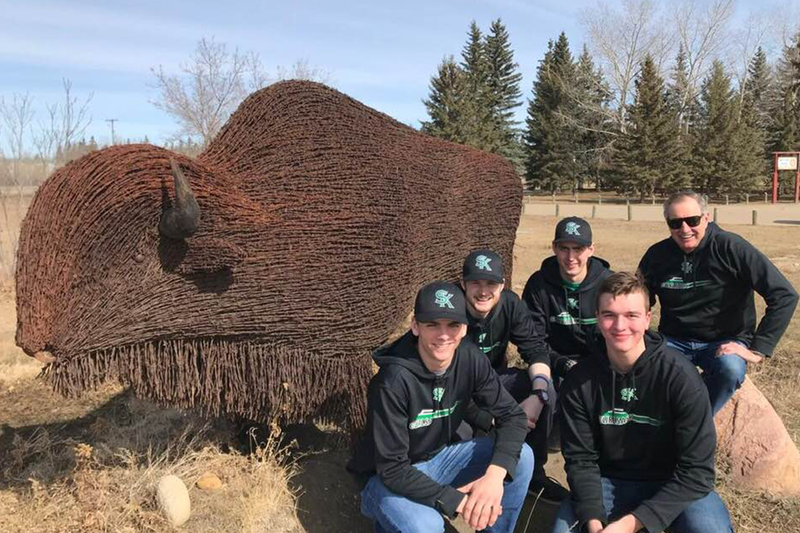 The team met in Saskatoon and from there the boys and Verne traveled together. Verne had five hours of their undivided attention to depart some of his wisdom on them! After checking in at the host hotel, The Clarion, we went out for a nice supper with Team Saskatchewan Girls (Team Haupstein) and their families. Back at the hotel there was time for more socializing. 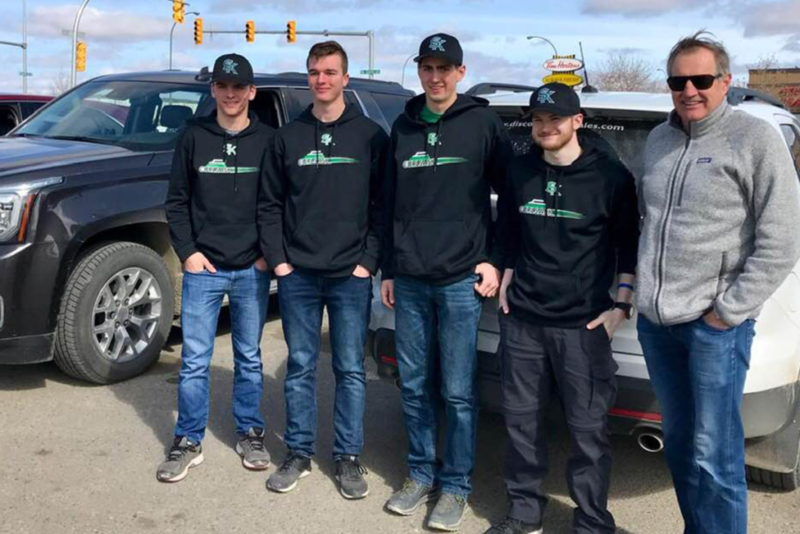 The team is enjoying reconnecting with some of the returning players they met last year in New Brunswick. Monday morning the boys and their dads drove to the Ritchie Brothers auction site in Edmonton. You can’t take the farm out of the boys or their dads! In the afternoon the team checked out the curling rink and the arena. They watched some of the practice sessions and the ice is going to be great. The event coordinators had a bit of a scare as 3 hours before opening ceremonies the venue, Millennium Place, was surrounded by fire trucks, police cars and emergency vehicles! No one was being allowed entry. Apparently it was not as bad as it looked. It was a small fire in the mechanical room…. or something like that! After a tense hour or so it was determined the event could carry on. We are so fortunate because what a fantastic Opening Ceremonies it was! The host committee did a fantastic job. Not just a piper but a whole band of them! The Alberta Society of Pipers and Drummers led the athletes in. Each team crossed the stage and they introduced each individual athlete and coach. Of the 150 plus names only one got messed up … our very own Nathen Pomedli! Opening ceremonies was not held on an ice surface so the committee had 150 blow up curling rocks at the event. For the ceremonial first rock toss each player threw their rock into the air. What a great and unique way to open the event! A parade of champions with many past and present champions from this area were at the opening ceremonies and were available for signing autographs. The Randy Ferby team, Wheelchair Canadian champions, even Wadena local Dustin Mikush who goes to school in Alberta was there with his championship Alberta team. 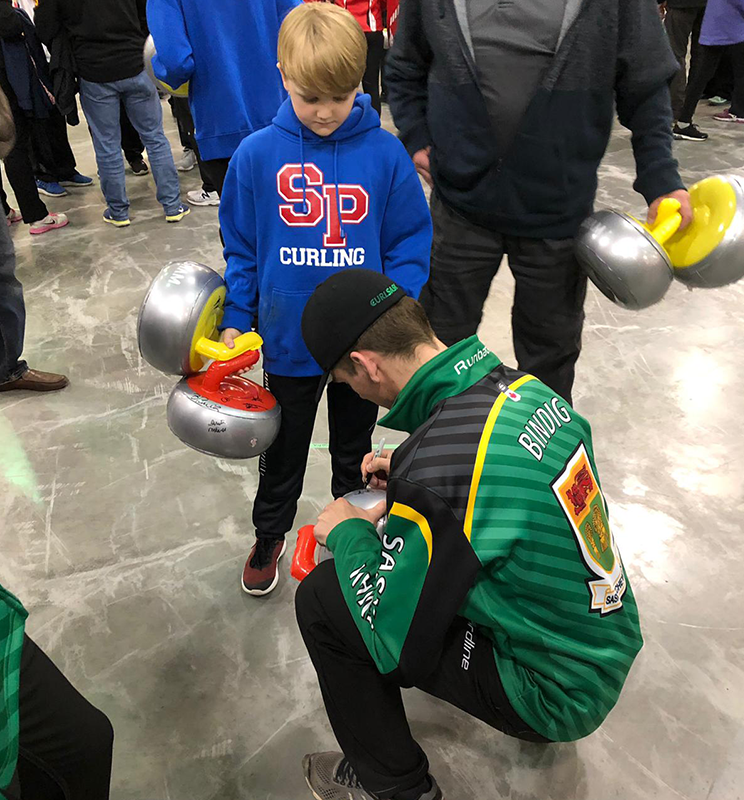 Some junior players asked Team Bindig players for their autographs! The evening wrapped up with a social and supper for the athletes and a coaches meeting for their leaders. Everyone is looking forward to starting the round robin games today.